YG BLACKPINK Jisoo released her perfect visual teaser! With BLACKPINK starting their comeback D-9 countdown, member Jisoo's personal teaser has been released. YG Entertainment released the teaser poster of Jisoo, the third main character after Lisa and Jennie, on their official blog at 9 a.m. 27th. Unlike her usual lovely and elegant image, Jisoo overwhelms her eyes with a more powerful pose and eyes. Especially, the red orange color of hairstyle changes perfectly captivate her fans. 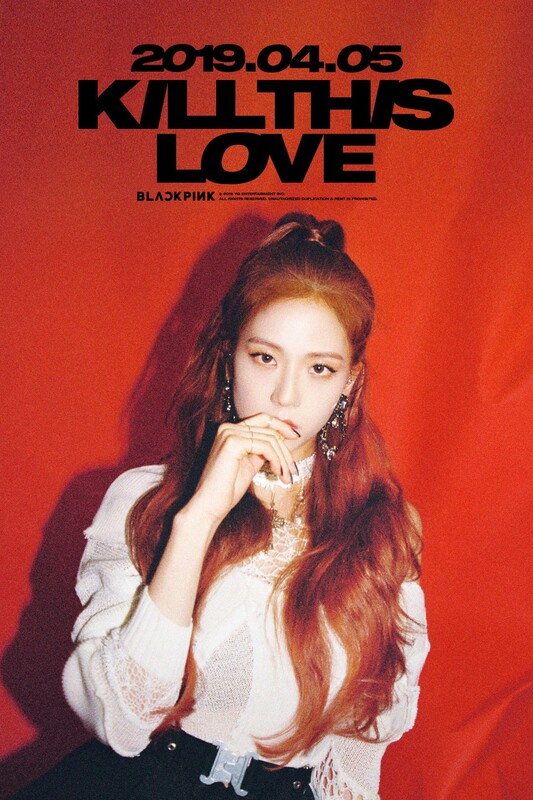 On April 5, Black Pink will once again shake the K-pop scene with their title track "KILL THIS LOVE" and EP album of the same name. Prior to their comeback, they pointed out three expected points. BLACKPINK will once again work with Teddy, a "hit song maker" who has worked on all the songs since their debut. Their synergies can be said to be the best, as they are ranked No. 1 on the music charts with all their activities such as "Whistle," "BOOMBAYAH," "Playing With Fire," "As if it’s your last," "Stay" and "DDU-DU DDU-DU" and have nearly 3 billion views of their music videos released so far. Teddy knows all about Black Pink's strengths, charm, and potential, he is the best person to Black Pink. "KILL THIS LOVE" is the main theme song with lead bras and grand drum sounds. The charismatic rap and vocals of each member added to it completed a track of high quality. In addition, as the four world class choreographers have been united, they boast a more dynamic performance than the choreography of any song they have performed so far. ▼ Coachella X North American Tour...Take off as a World Star! Black Pink will begin full-scale U.S. activities with its new EP album. will be staged on April 12 and 19 at the "Cochella Festival," the largest music festival in the U.S., starting in Los Angeles in the U.S. and hosting various local promotions along with a tour of North America starting on April 17. "KILL THIS LOVE," which will take off its veil on April 5, is also shining on the global stage and is expected to make a perfect leap forward as a world star.